Home 1960s funny vintage ads Sugar is Good For You! In the mid-60s, American sugar manufacturers had a growing crisis on their hands. 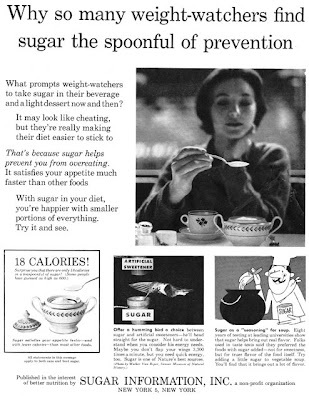 Artificial sweeteners such as saccharine were being used to make food products, particularly soda, more diet-friendly and attractive to consumers. So Sugar Information Inc. launched an advertising campaign meant to show people the benefits of consuming good old-fashioned sugar. Sugar was touted as promoting energy and as an effective diet aid! Artificial sweeteners = energyless + bad. Note to mothers: Exhaustion may be dangerous - especially to children who haven't learned to avoid it by pacing themselves. Exhaustion opens the door a little wider to the bugs and ailments that are always lying in wait. Sugar puts back energy fast - offsets exhaustion. Synthetic sweeteners put back nothing. Energy is the first requirement of life. Pay safe with your young ones - make sure they get sugar every day. "Play safe with your young ones - make sure they get sugar every day." Sure! What parent wouldn't want a hyperactive child on a sugar high? Need more proof of the energy producing benefits of sugar? 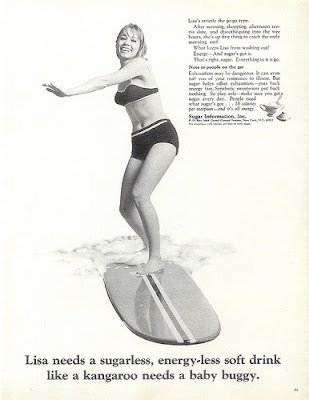 Well, sugar keeps this surfer girl going as well! By the way, the animal metaphores in these ads crack me..."she needs energyless artificial sweeteners like a turtle needs a seat belt...like a kangaroo needs a baby buggy..." Hey, wait a minute - a momma kangaroo might appreciate a baby buggy, instead of carrying a joey around in her pouch all day! 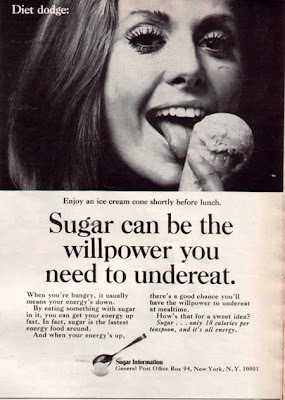 Mostly, though, the Sugar Information Inc ads seemed to promote sugar as an easy trick for losing weight...these next two instruct you to treat yourself to an ice cream or cookie before lunch. I think all that would accomplish would be ruining your appetite for lunch and making you ravenous later on. 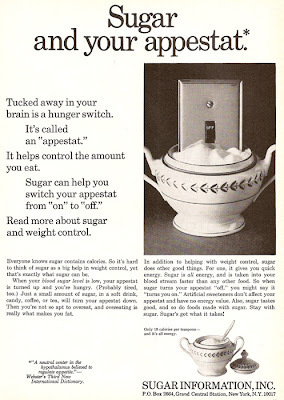 "Sugar and your appestat"...I know what you're thinking: what the hell is an appestat??? In all fairness, this campaign wasn't *exactly* wrong, maybe just a little misguided. Sugar does give you energy - and runners are known to consume those gummy looking "goo" snacks for a quick boost during a race. However, the ads didn't take into consideration the sugar crash that comes after the high - what goes up must come down, as Blood, Sweat & Tears sang at the time. And, given the choice of an artificial sweetener and natural sugar, I'd choose the latter every time. I never drink diet soda or use anything other than sugar in my coffee, tea, or baked goods. But like anything else, sugar is safest in moderation - and these ads seem to be giving consumers the green light to go sugar crazy! Not something that would fly in today's obese world, for certain. 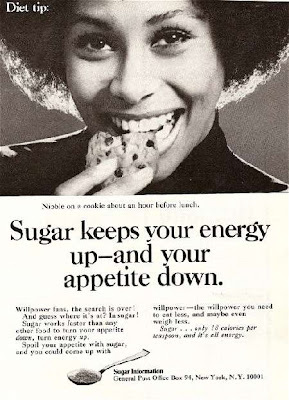 I remember that cookie as appetite suppressor...back in the day.